The ACR38 IPC USB desktop reader from ACS is a high speed USB 2.0 device housed in a neat white casing. This reader is fully PC/SC, CCID and EMV Level 1 compliant and supports all ISO 7816 microprocessor-based smartcards as well as numerous popular memory cards. Perfect for many smartcard-based applications on desktop PCs, the reader comes complete with WHQL approved Windows drivers, as well as support for other operating systems such as Linux. The ACR38 IPC is a popular and cost-effective smartcard reader that complies with the latest industry specifications. The white case design provides an alternative to the standard model of ACR38. The ACR38 is also available as an SDK containing one ACR38 USB one ACR38T-IBS USB (a SIM-sized plug-in Smart Card Reader), 20 smartcards (10 of ACOS2/3, 5 each of SLE4428, SLE4442), a balance reader and a CD-ROM containing useful learning tools, sample code and demonstration software. All these readers contain the same series of ACS controller chip housed in different casings with varying additional features. 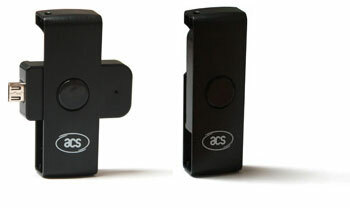 The ACR38 SAM model contains a built in SAM card slot. The ACx38 series of readers are single chip solutions that have been certified by EMV Level 1, FCC, CE and Microsoft WHQL. Standard PC/SC drivers for Windows, Linux and Mac OS X come with every product. A synchronous memory card API is also available in the SDK. Also CCID compliant where shown. Demo programs Showcases ACR38 features and capabilities e.g. e-purse, logical access control, etc. Script Commander PCSC - allows you to send a predefined sequence of smart card commands to your CPU card. Further pictures of the ACR38U-ND are shown below.